Separate the components of a variety of soils from different locations and compare their differences and similarities. home-made or purchased sieves. To make a series of different-sized sieves, we made wooden frames and tacked three different mesh sizes to them (3/4” mesh, 1/4” mesh and window screen mesh with about 1mm openings). One set for each group of students. Students work in groups, ideally 4 students or less, each group with a set of sieves, and one or more soil samples. Scoop a small amount of soil into the sieve. Shake the sieve over a clean tray so that the small components fall into the tray and the large components remain in the sieve. The separated components make it easier to study what the soil is made up of. ￼Dump the soil onto the large mesh sieve laid over a tray. 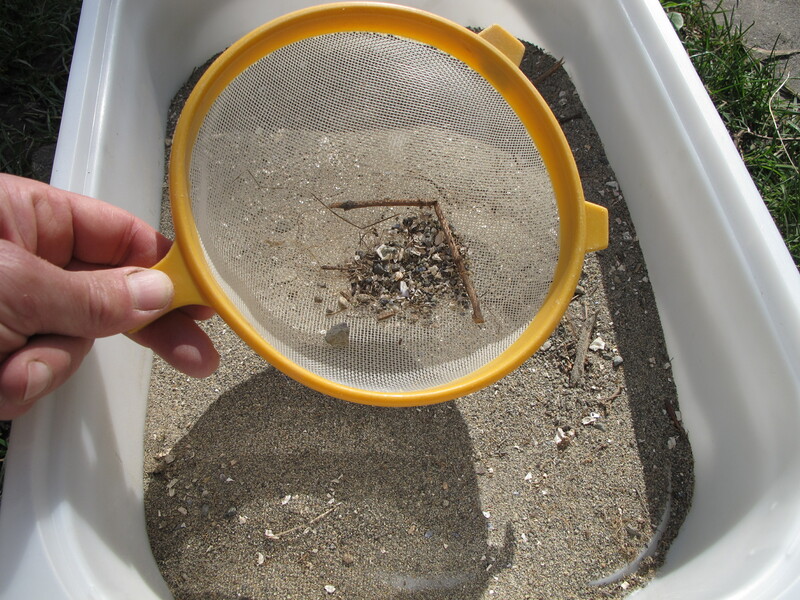 Shake the sieve and tray simultaneously until soil stops falling through the sieve. Transfer the large soil components trapped by the sieve onto a sheet of white paper. Dump the contents of the tray onto the next smallest sieve size (sitting on a tray), repeat the shaking, transfer the trapped components to a new white sheet of paper. Repeat for the smallest sieve size. Transfer the soil remaining in the tray after the third and final sieve to its own sheet of paper. 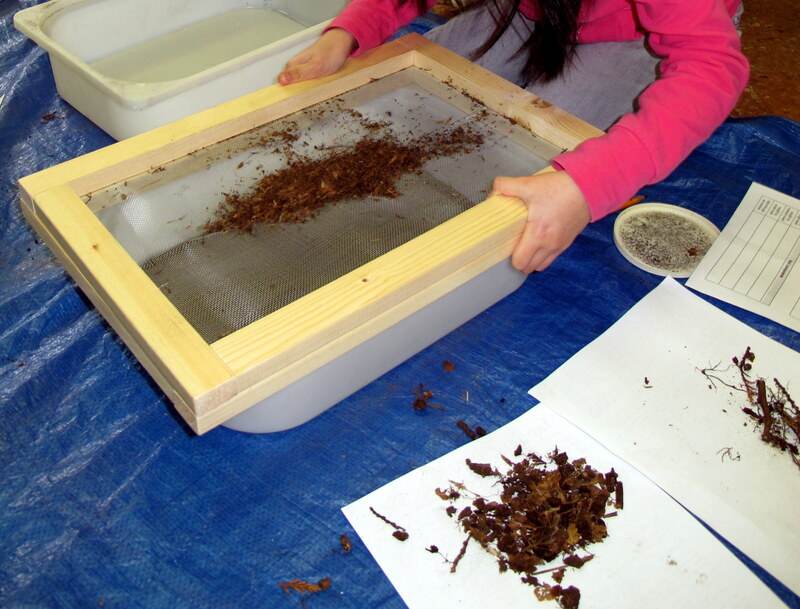 Clean the sieves then repeat the soil component separation for the other soil types. For each of the soil types, lay the separated components side by side to show the change in the soil components between soil types and from large to small. 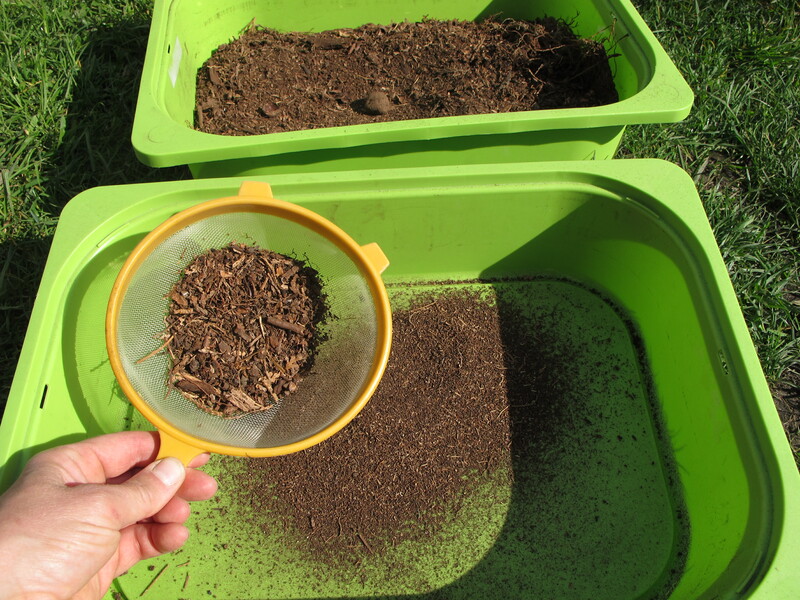 This activity was run in a free-experimentation lesson using two soil types and one sieve size. Students were allowed to explore as they liked (though were requested to keep the soil types separate and in the trays). They took notes on what they found. We gathered as a class and heard what the students had found. Then students chose a particular aspect of the activity that they wanted to pursue further, then returned to the materials to investigate this further, partnered with students that had a similar interest. A K/1 class did one soil type, a 2/3 class did all 3 soil types over a couple of sessions.